The development of mobile applications has become one of the largest industries of mobile technologies and hundreds of thousands of apps exist for mobile users in almost every category: game s, lifestyle, social networking, education, business, etc. In the Apple App Store alone are more than 450,000 iPhone/iPad Apps and counting, many are even free, but many others are not which means mobile applications are truly a growing source of business. Making relevant and engaging mobile apps is a smart idea for developers and entrepreneurs who want to cash in on the mobileApp craze. Developers of iPhone, iPad and Android are asking what is the best business model for generating revenue from mobile applications? There are a number of ways to monetize a mobile app and each has some advantages and disadvantages. It is the developer’s job to find out which model suits their App. Make money from initial purchase and upgrades: The most obvious way to generate revenue from apps is to sell them. Mobile app stores provide fairly straightforward revenue-sharing programs, so it is easy to figure out how much revenue you can generate from downloads and upgrades. Ad-supported apps: Many mobile app developers are developing revenue through ads that run within the apps. Both Google and Apple are trying to make it easy for app developers to incorporate targeted ads inside apps. With ad-supported content, the key is to make sure that the ads don’t detract from the user experience in the App. In-app purchase: While In-app purchases can be valuable for any mobile app, they seem to be most valuable as part of a “freemium” revenue strategy. Under the freemium model, the mobile app is free for users to download. 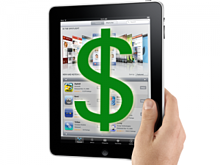 Developers monetize by selling additional content or features via in-app purchase. In-App purchases are successful when the flow for purchasing feels natural to the App. This model works well in productivity, content and gaming, for accessing advanced features of the app. For example, after users master the free game they buy more levels. Subscriptions: There is not necessarily any actual content downloaded with the App itself. Instead, content is unlocked to subscribers, using a user-management layer that sits on top of in-app purchase. Many magazine, newspaper and other content providers are utilizing this strategy. Most Magazines for e.g. include one free issue, but the rest need to be purchased either singly or via a subscription. Video Integrations: It's a way to get revenue by making money when users watch videos. Companies like Sharethrough, RockYou and VideoEgg help developers monetize with video. Brand Takeovers: Here, the entire App is essentially one big brand campaign. For this strategy to be successful, the audience for the application has to be segmented and have a well-defined niche in order to attract brands and marketers, who can then offer targeted, branded ad campaigns. Any app publisher or app developer can be successful in generating revenue using mobile applications. However, in order to make the most of their development efforts they must ensure that they understand their app objectives, plan for user engagement, retention, and revenue generation.